The rapidly declining living conditions in the Gaza Strip and occupied territories has endangered the most basic of internationally recognised of human rights, as children continue to be collateral damage in what can be boiled down to a political standoff. The difference to almost all modern countries is that Israel uses extreme force to break the deadlock. It is now sadly a fact that more children than Palestinian fighters are being killed in the offensive on Gaza by the state of Israel. This in itself should be shocking until you see the numbers. 28 per cent killed are five years and under, 92 per cent are sixteen and under with 8 per cent aged 17 and 18 – but still classed as minors. More babies aged under 24 months die than those aged over 16 years. Then there are the incarcerations. The Isreali Information Centre for Human Rights in the Occupied Territories records them. It shows that in the ten years from 2008 to 2018 – a staggering 2,370 children have been sent to Israeli prisons. At the end of January 2019, 209 Palestinian children were held in Israeli prisons as security detainees and prisoners. In January this year, the General Federation of Palestinian Trade Unions (PGFTU) warned that the poverty rate in the Gaza Strip has exceeded 80 per cent for the wider population. The numbers for mental health problems, access to health care or the basics such as access to clean water, electricity and sanitation are dire. It shames Britain, that a country, ranked by the World Justice Project as the 8th most law-abiding country in the world actively supports a regime with weapons of death and destruction, described by organisations such as War on Want and the United Nations as an apartheid state. Others, including Human Rights Watch, accuse Israel of war crimes against defenceless Palestinians. To enable that support, a media blackout is required in Britain. Here, Mark Curtis unravels the grizzly truth of Britain’s involvement in this ghastly and illegal aggression and what is really going on behind the scenes. 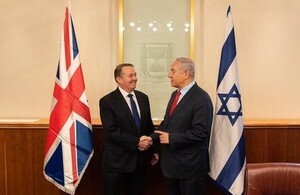 In striking evidence of Britain’s reliance on Israel’s cybersecurity sector is the report’s claim that since major British banks are clients of many Israeli cyber companies, “the vast majority of digital transactions and credit card e-commerce in the UK is essentially protected by Israeli technologies”. In September, the government revealed that it was providing military training to Israel. This followed news in 2016 that British military pilots were due to be trained by a company owned by Israeli arms firm Elbit Systems. Training is longstanding: in 2011, it was revealed that British soldiers were being trained in Israel in the use of drones that had been “field-tested on Palestinians” during the 2009 war in Gaza.